Setting up VirtualBox to run Debian and FreeBSD VMs headlessly, with the system console accessible over a virtual serial port. First set up a serial port in VirtualBox. In the Details section for the virtual machine, click Serial Ports, check Enable Serial Port, set Port Mode to Host Pipe, check Create Pipe and put e.g. 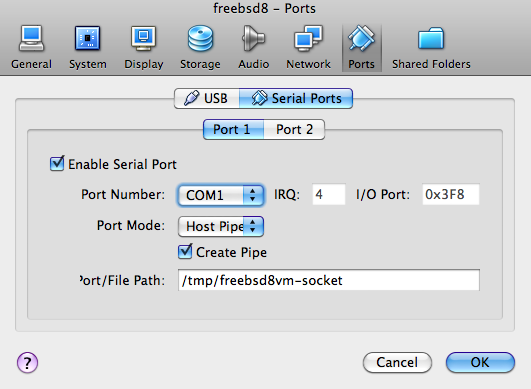 /tmp/freebsd8vm-socket in Port/File Path. Now start the virtual machine. Use socat to connect the domain socket created by VirtualBox to a pty. It should be possible to now connect to the serial port with screen. If you disconnect the screen session the pty will be removed, so the above socat command will need to be run again. This worked for me on FreeBSD 8.0-RELEASE. It should work similarly on other releases, but device names might change or something. Tell the boot loader to use the serial console, which also makes the kernel do so. To make the console more responsive, we tell it to use a higher speed connection than the default 9600bps. Edit /etc/ttys and change off to on, dialup to vt100, and the speed to 38400 on the entry for ttyu0. The relevant line should look like this after editing. Reboot for /etc/ttys and /boot/loader.conf be re-read. These instructions apply to Debian Lenny, but probably will at least mostly work on other Linux systems as well. Uncomment/modify this line in /etc/inittab for serial console. Tell init to re-read inittab, which will make the serial console start working immediately. Now we have to tell grub and the kernel (via grub) to use a serial console as well. Add the following to /boot/grub/menu.lst. and add arguments to use a serial console. It will be necessary to reboot so you can see that grub and the kernel are using serial. It is handy to be able to ssh to the VM. When using the default NAT network configuration for VirtualBox, the only way to make network connections from the host to the guest system is with port forwarding. The following commands will forward port 2222 on the host to 22 on the guest VM. Unfortunately this makes the host listen on 0.0.0.0, and I have not found a way to make it only listen locally.